Geek & Sundry has released "The Chronicles of Exandria Vol. I: The Tale of Vox Machina," a whimsical art book compiled of fan art inspired by their Dungeons & Dragons series Critical Role. The art book features a curated selection of artwork from 89 community artists worldwide, who have all been inspired by their love of Critical Role with art work selected by the cast of Critical Role. 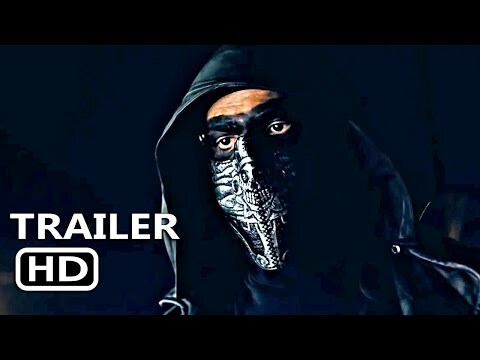 Critical Role is Geek & Sundry¹s live multi-platform role-playing show featuring Dungeon Master Matthew Mercer and Vox Machina, a troupe of fellow voice actors Ashley Johnson, Marisha Ray, Taliesin Jaffe, Travis Willingham, Sam Riegel, Laura Bailey and Liam O¹Brien. Each week, nearly hundreds of thousands of viewers tune into Critical Role to watch the show with the series racking up over 53 milion total views. As an homage to the ³Critter community² the entertainment phenomenon¹s fervent official fan following, who submit over 400 fan art creations each month, the cast and team behind the show have curated this breathtaking book of over 250 artworks, to immortalize the epic tale that is Critical Role. ³Week after week, the talented members of the Critical Role community reflect moments of our story back at us with their art, and gathering up all that passion in once place has been absolute magic, ³said cast member Liam O¹Brien. "The Chronicles of Exandria Vol. I: The Tale of Vox Machina" is offered in a deluxe edition and a standard version. The standard edition features cover art by renowned artist Joe Madureira, while the limited deluxe edition is bound in a striking red leather and gold foil cover and features a ribbon bookmark, while the artwork is impactfully presented on premium stock paper. The standard edition of The Chronicles of Exandria, Vol. I is available for $59.99, and the deluxe edition for $124.99 with Alpha members receiving a 10% discount. 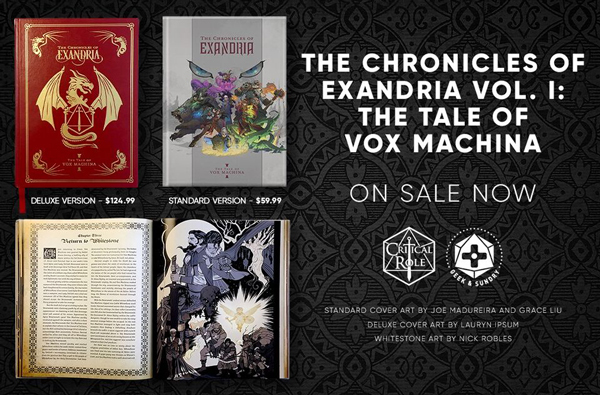 Along with the stunning artwork, readers will find detailed retellings of Vox Machina¹s greatest adventures, preserved for all time in a volume for Critical Role fans to pick up time and time again. Published by Hunters Books, both editions of this amazing volume are now available on the Geek & Sundry online store. For further details and order information on "The Chronicles of Exandria Vol. I: The Tale of Vox Machina," please visit shop.geekandsundry.com. Watch Critical Role Thursday nights at 7:00 PM PT on the Geek & Sundry Twitch channel and on Alpha.